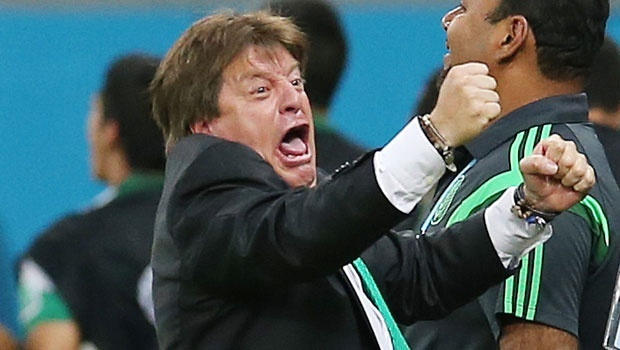 Everyone’s favorite world cup coach, Mexico’s Miguel Herrera, is back, this time on the hot seat as his team has gone winless in their past 7 matches. Recently, Mexico has failed to recapture their World Cup form, as they have struggled in international friendlies and the Copa America (albeit they fielded a B squad for the tourney). Despite their poor run of form, there are high expectations for Mexico to come out of this tournament with a title given their history as the tournament’s winningest team (6 Gold Cup titles). Mexico’s first Group C match took place in Chicago at Soldier Field against the 104th ranked Cuba team, the 2nd-lowest ranked team in the tournament. Mexico dominated the game from the early stages against a clearly inferior Cuba side, as they controlled all aspects of the game and were rarely threatened on the defensive end. The game ended 6-0 and could have been much worse if Mexico had been more efficient with the many chances they created in the game. Goals came from Oribe Peralta (3), Andres Guardado, Carlos Vela, and Giovani Dos Santos. For a more detailed game summary, check out Fox Soccer’s recap here. Below are my three main takeaways from the game. In addition to the huge disparity in talent between the two sides, Cuba faced a major setback entering the tournament as they are without 6 key players plus their manager due to visa issues. While it is unlikely that this made any difference to the end-result, it further stacked the odds against the Cubans. Cuba had no answers for Mexico’s midfield-dominant 4-4-2 formation and possession-based playing style, as they yielded numerous chances and rarely forayed into Mexico’s penalty box. The stats reflected this dominance, as Mexico had 76% of possession and 44 shots vs. Cuba’s 3. What killed off Cuba in particular, was their defenders’ failure to track runners and inability to clear balls amidst Mexico’s attacks. All in all, Cuba was lucky to leave this game with only a single digit margin of defeat. The lack of defensive burden allowed Mexico to display their attacking quality from all areas of the pitch. The wing backs, Miguel Layun and Paul Aguilar, were able to repeatedly find space down the wings to play dangerous crosses into the box. In the midfield, Hector Herrera and Andres Guardado effectively cut inside from the wings to contribute in the final third with incisive through balls for the strikers to latch onto. In the forward position, Carlos Vela, who was playing his first competitive international match since the 2010 World Cup, displayed the value of his attacking instincts and speed, with his dangerous runs resulting in a well-deserved poacher’s goal. Vela’s strike partner, Oribe Peralta, showed once again why he was preferred to Javier Hernandez in the World Cup, with three well-taken penalty box goals. 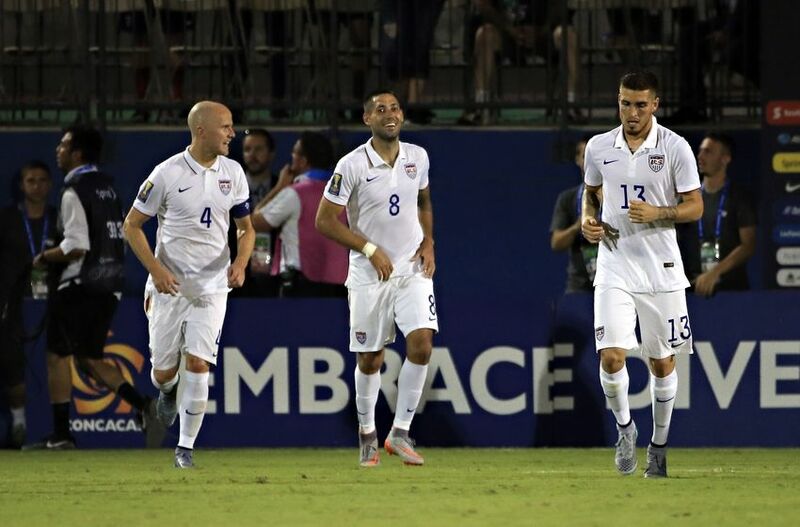 The Honduras match revealed some key defensive and midfield weaknesses for the U.S, which an in-form Mexico side should be able to exploit. Mexico is a team well-equipped to give the U.S. trouble, mainly due to their strong central midfield which can dominate possession, something the midfield pairing of Bradley and Beckerman was unable to do against Honduras. In the Honduras match, the center backs (Brooks and Alvarado) were not compact and left themselves exposed far too often, yielding numerous half-chances for Honduras. Given the creative passing ability of their midfield and the high quality of their strikers, Mexico has the tools to punish an inexperienced U.S defense. In the past, the U.S team has also been vulnerable to counter attacks due to the attacking nature of the wing backs (Johnson and Chandler) and the lack of recovery speed of the center backs. Mexico have the ability to be a potent counterattacking team, due to the pace of their attackers, as shown on the 6th goal by Giovani Dos Santos. If the U.S meet Mexico in the final, they will need to greatly improve on these flaws from their first game, in order to win this tournament. Although he was not completely clinical with his chances (3 goals on 12 shots), Peralta made intelligent runs into the box throughout the game to get into dangerous areas, allowing his teammates to find him often. This resulted in a hat-trick of quality strikes, and if Peralta can be more clinical with his finishing, he will cause major problems for even the stronger sides in the tournament. Next up for Mexico: Sunday, July 12 vs. Guatemala at 9:00 PM EST on Fox Sports 2.